Preheat oven to 325 degrees F. Butter a 9 by 9-inch pan. In a small bowl, beat together eggs and vanilla extract. Set aside. In a saucepan, melt the 1/4 pound of butter over medium-high heat. Add water and bring to a boil. Stir in the sugar, bring back to a boil, then add chocolate chunks*. Whisk to combine well. *Cook’s Note: Since butter mixture is so hot, the chocolate will melt rapidly. Pour into a large bowl and allow to cool. Add eggs and vanilla to the chocolate mixture and blend together using a hand-held blender. Add the flour mixture and blend until combined. Fold in pralines and chocolate chips. Pour batter into the prepared pan and bake for 25 minutes. Once done, remove from the oven and allow brownies to cool before adding topping. 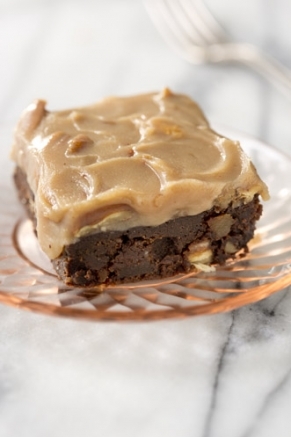 When brownies and topping have cooled, completely frost brownies, cut into squares and serve. *Cook’s Note: Constantly stir and pay attention to temperature in order for the topping to come out well. In a saucepan over medium heat, add sugar, butter and milk. Stir with a wooden spoon for about 20 minutes or until mixture registers 224 degrees F on candy thermometer. Immediately turn off the heat once it reaches the temperature. Fold in pecans. Allow to cool, about 30 minutes.